Roderick Richardson is an independent, experienced and reputable numismatist. Coin Dealing Services Coin & Medal Dealer Services. Advice – independent appraisal of lots is advisable for collectors. To place an order telephone or e-mail at any time, details are on the contact page. No coins are stored at the antique centre over night. Only low value coins are on display. The "Circular" Coins can all be viewed by appointment, but only by mutual arrangement IN LONDON, as this is where the coins are housed. Coins can be viewed by post against payment as per our terms and conditions. to view a coin in more detail, or to make an enquiry about a coin please click either of the images for that coin. Angel 1505 Heanry V11 Angel type V mm Pheon (1505-9) S.2187. Choice Extremely Fine. Guinea 1676 Charles 11 Guinea 1676, 4th bust. S.3344. A prooflike specimen which must be a very early striking with reflective fields & a strong portrait. Very Rare in this grade & the best I have seen. Good Extremely Fine. Crown 1601 Elizabeth 1 Crown mm 1 (1601) S.2582. some light marks on flan otherwise lightly toned & Very Fine +. Crown 1652 Commonwealth Crown 1652/1 mm sun. ESC 5, Bull 5 (R3) Extremely Rare, Toned & Extremely Fine. Crown 1658 Cromwell Crown 1658, ESC 10, S. 3226, A couple of light hairlines in field otherwise lightly toned & Extremely Fine. Crown 1658 Cromwell Crown, Tanners copy dated 1658. ESC 13, Bull 246, S. 3226B (R4) Less than twenty examples known. Tiny flan flaw at 5 O clock on rev' but a beautiful piece, Extremely Rare & Virt' Mint. Crown 1746 George 11 PROOF crown 1746, edge vicesimo. ESC 126 (1992 edition) S.3690. A superb specimen beautifully toned & mint state. Crown 1817 George 111 crown Incorrupta 1817 by W.Wyon. ESC 229. Purchased from Baldwins, 1945: Slaney, Spink auction 14/5/2015 Lot 522. Dark toning on underlying brilliance. Very Rare & mint state. Crown 1847 Victoria Gothic Crown 1847 plain edge, ESC 291, S.3883. Two tiny marks in field on obv' otherwise a lovely coin with a light tone & virtually mint state. Half Crown 1551 Edward V1 Halfcrown, Galloping Horse 1551 mm Tun. S.2480 but reads HIBE. For Ref' See Lockett 4377. Toned, very rare & Very Fine. Half Crown 1601 Elizabeth I Halfcrown mm.1 (1601) S.2583 A little flecking on obv' but a lovely coin with a detailed portrait, deeply toned & EF/NEF. Half Crown 1638 Charles 1 halfcrown Briot 2nd issue mm Anchor & B. S.2858. A very pleasing piece, well struck up & with an even grey tone. Rare. 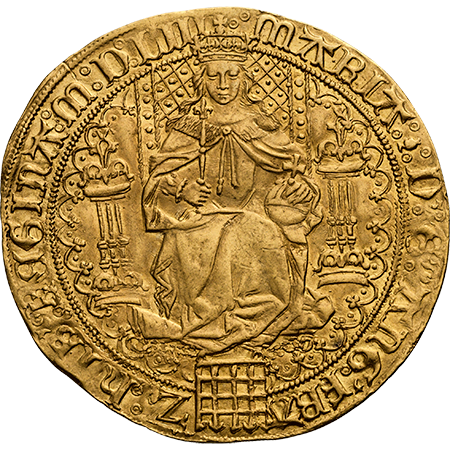 Half Crown 1653 Commonwealth Halfcrown 1653 mm Sun. ESC 431, Bull 30. Second N over inverted N in England. Ex Dr Carter, collection purchased Baldwins 1950. Toned, scarce & Almost Extremely Fine. Half Crown 1666 Charles 11 Halfcrown 1666, Elephant below bust, ESC 461, Bull 447, S.3364. Ex Law coll'. Extremely Rare, toned & a really Good Fine. Half Crown 1693 William & Mary Halfcrown 1693 over 3 inverted. ESC 521, S.3436. Deeply toned with good eye appeal. Nearly Extremely Fine. Penny 1135 Stephen (1135-54) Penny, Voided Cross & mullets type, Castle Rising. RODBERT ON RIS. Ref- Allen (BNJ) 2012 page 108. N 878, S.1280. Toned, Extremely Rare & Good Very Fine.